There’s abundant energy coming into WestSide High School these days, and not just from wiry teen-agers. Light from the sun, known in the building industry as daylighting, is a key feature among several environmentally friendly attributes built into the new alternative school on Ninth Street in Wenatchee. 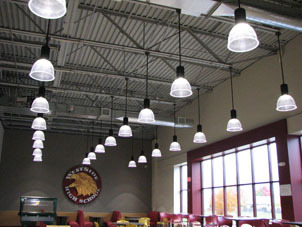 Light from the outdoors and from energy-stingy LEDs illuminates the WestSide High School cafeteria. Windows around the perimeter bring ample light into classrooms. Light streams through six traditional skylights, and eight Solatubes – tubular skylights that use polished metal and Plexiglas to capture and diffuse light – outshine the LED lights next to them. Unique LED lighting decorates the ceilings, from silver-dollar-sized LEDs in inverted-bowl-shaped fixtures to troffer hallway lights that switch off when no one’s around. Motion and daylight sensors are a key part of the energy-efficiency equation in WestSide High’s construction. “The classrooms are on occupancy sensors, and there are no wall switches in the halls,” explains Bryan Visscher, director of Facilities and Risk Management for the Wenatchee School District. As daylight increases, lights dim. As sunlight wanes, lights grow brighter. The school is cutting-edge for the district and for Visscher, who has championed energy efficiency at all 12 schools and helped the district win six EPA Energy Star awards. This time he’s been able to incorporate efficiency measures from the get-go rather than retrofit old systems with new technology. 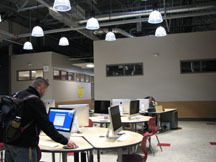 A WestSide student uses the computer center while others are in class. About 250 students are enrolled in the alternative high school, which offers small class sizes and individualized learning. Ameresco, the environmental services company under contract to instill and install energy efficiency, will measure and verify expected energy savings.The new WestSide uses a variable refrigerant flow system for heating and cooling that reduces energy waste. Lines run throughout the building, allowing heat from a warmer side, for example, to be transferred by refrigerant to a cooler side. Traditionally the warmer air would have been ejected outdoors. The Mitsubishi system uses variable-speed fans and evaporators and sophisticated native controls to reduce energy consumption and improve comfort. “An overlay of automated logic” runs the HVAC system, Visscher said, which offers opportunities to schedule actions such as shutting off the half of the building that’s not used for night school. It’s also the first building in the district to have electronic access controls for immediate lockdown in case of emergency. The 18,000-square-foot building was once Wenatchee’s Eagles Lodge. It was gutted to make way for WestSide. The building had been used by Wenatchee Valley College as a music and arts center, then acquired by the school district in a swap that gave the former WestSide building back to the college. Years ago, that building used to be college dormitories. Students moved in Sept. 1, leaving cramped, concrete-block classrooms behind. They can eat their lunches, prepared in a full-sized commercial kitchen, in a spacious cafeteria now. They can access computers in an electronic library. They can work on projects together in “teaming rooms.” They can go to class in rooms that are mostly windows, not walls. P.E. classes are still held at the old campus, but an anonymous donor has offered to help build a gym on the school’s north side. In the meantime, the district will begin converting the old Wenatchee Youth Circus storage building, located just west of WestSide, into a fitness building where students can use exercise equipment and free weights. Chelan County PUD is joining some 2,000 public utilities across the country in celebrating affordable rates, community involvement and care for the environment, among the many benefits of public power. Help us collect canned/boxed food and personal care items for neighbors in need. Donations are being collected at PUD offices in Wenatchee, Chelan and Leavenworth and at Rocky Reach Visitor Center from 8 a.m. to 5 p.m. (4 p.m. at the Visitor Center) through the week to benefit the Chelan Food Bank, Upper Valley MEND and Serve Wenatchee Valley. Visit us on Facebook for a chance to win a portable emergency weather radio. Enjoy cookies and coffee on Friday, Oct. 11 at our three officesand Rocky Reach Visitor Center. We’ll be at five Chelan County schools sharing ways to stay safe when using electricity. Learn how to be winter ready from noon to 2 p.m. Saturday, Oct. 12, at Camp Zanika Lache at Lake Wenatchee. Enter to win door prizes – storm preparation kits, one for home and one for your car; learn how to keep your home “tree safe;” talk with linemen about electrical safety and get tips on what to do if the lights go out. Been itching to get your hands on an iPad? Chelan County PUD customers can enter a drawing to win an iPad when they sign up for Powerpay online bill payment or take a Powerpay survey. Customers who enroll in Powerpay through December 16 will be entered into the drawing. Customers already enrolled in Powerpay will receive an email inviting them to enter the drawing by taking a brief survey. One lucky customer will win a 16-GB iPad with retina display valued at $499. Online bill payment is fast and easy. Customers receive electronic bills more quickly — usually one day after meters are read compared to seven to 10 days when paper bills are processed through the mail. Customers save a few cents each month by not using a stamp. And Powerpay customers reduce the use of paper, helping the PUD operate sustainably. Each customer enrolled in Powerpay saves the PUD 54 cents a month in bill printing and mailing costs. Thirty-five solar and wind producers participating in Chelan County PUD’s Sustainable Natural Alternative Power (SNAP) program have received checks from the PUD totaling nearly $42,000, a record. Juan and Susan Mendoza placed 12 solar panels on their home in Manson this past year. The goal of the state program is to encourage the development of small-scale renewable energy production and solar equipment manufacturing in Washington. Producers who use equipment made in Washington are paid at a higher rate. Chelan PUD makes the payments, and earns a tax credit equal to the cost of those payments. The incentives program began in 2005-06 and runs through June 2020. SNAP began in 2001. The SNAP program relies on voluntary customer contributions to pay producers for their power. Those payments are made on or around Earth Day, April 22, of each year. SNAP contributions have resulted in an average payment of 21 cents per kilowatt hour over the last eight years. In 2012-13, SNAP producers shared $24,675 in customer contributions. Chelan County PUD customers are saving energy — three times more than just a few years ago. Mark Wiser, senior residential energy adviser, checks out a window installation. A PUD program helps customers upgrade to energy-efficient windows by covering part of the cost through rebates. In the two-year period of 2010 and 2011, the average annual conservation savings totaled three times the average annual savings in the previous decade. Seventy percent of those savings came from industrial customers, 24 percent from residential customers, and 6 percent from the business sector. Some 165,000 compact fluorescent light bulbs were distributed to residential customers through a direct giveaway and at reduced prices at retail stores in Chelan County during 2010-11. Andrew Grassell, manager of Energy Development and Conservation, told PUD commissioners on Tuesday that state auditors have verified savings of 3.38 average megawatts for the two-year time frame. Under the state Energy Independence Act, utilities must set targets to reach all cost-effective conservation, updating those goals every two years. Industrial customers can take advantage of programs to increase the efficiency of high-speed fans and other equipment. For example, Chelan PUD helped Stemilt reduce energy consumption at its largest fruit packing facility, Olds Station, by 30 percent. Programs available to commercial customers include better lighting. Residential customers have more than a dozen energy saving programs available including home weatherization and appliance rebates. Energy savings can translate into reduced costs, higher efficiency and increased comfort for customers. Chelan PUD customers: Thank you for conserving!